Every month, Field to Market uses “Farmer Spotlight” to give due honors to farmers that are using exceptional and or innovative sustainable farming practices. Three of the 12 honorees in June were rice farmers. 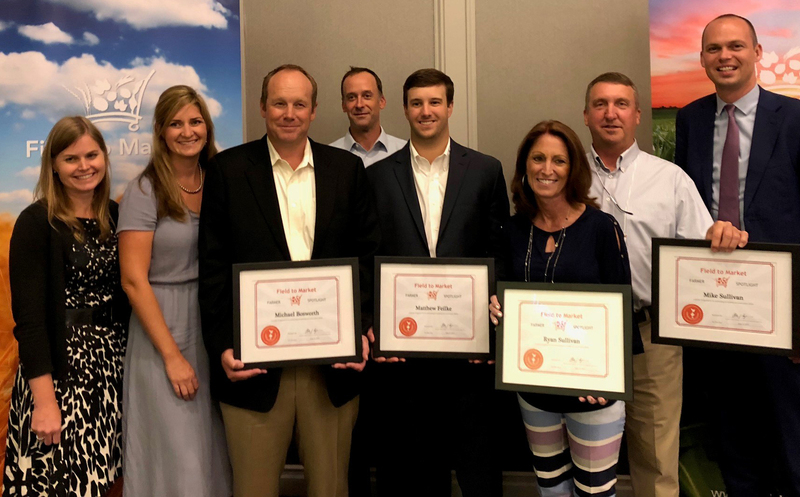 “When you consider the relative size of rice production to other crops, the fact that three rice growers were honored with this award is a testament to the stewardship of our industry,” said Josh Hakins, USA Rice director of grower relations for the rice stewardship partnership. The three rice winners were Michael Bosworth of Olivehurst, California; Matthew Feilke of Stuttgart, Arkansas; and father and son team, Mike and Ryan Sullivan of Burdette, Arkansas. As Hakins stated, the rice industry as a whole has made big pushes in the past few decades to increase sustainability. It’s no wonder others are beginning to notice. According to Field to Market’s annual report, rice has consistently improved on energy use, soil conservation, irrigation water use and greenhouse gas emissions all while increasing total production with minor increases in additional land use. It’s quite the feat for an industry that is now growing more than 1.2 million hectares (3 million acres) of rice each year in the United States. In some ways, a major sustainable farming practice that most rice farmers use, field flooding, is built into the growing season. USA Rice partnered with Ducks Unlimited, a wetlands conservation nonprofit, “to bring about meaningful and long-term improvements to three of the nation’s critical natural and economic resources: waterfowl, working rice lands and water,” according to the Ducks Unlimited website. Similar to how many farmers in other industries use cover crops in the off-season, rice farmers allow the field to turn into a temporary wetland for migratory animals like ducks. The winter flooding of the fields helps decompose straw, prevent erosion and control weeds. It also provides natural, healthy food for the wildlife and waterfowl in their winter home. The nutritious food helps strengthen the birds as they prepare to fly north again in spring— just in time for the rice to be grown and harvested again. But of course, there are other sustainable farming practices that shot these winners to the top. Ducks in a flooded rice field. The Feilke family farm focuses on collecting rain water through the winter; Bosworth’s farm, Rue & Forsman, has an additional 49 hectares (120 acres) of permanent wetlands for species that require a wetland habitat all year round; meanwhile Mike and Ryan Sullivan recently began growing furrow-irrigated rice also known as “row rice” which has proven to save the family money and decreased water inputs. Congratulations to the winners! To see photos of the winners and learn more about sustainable farming practices in the rice industry, please visit USA Rice.